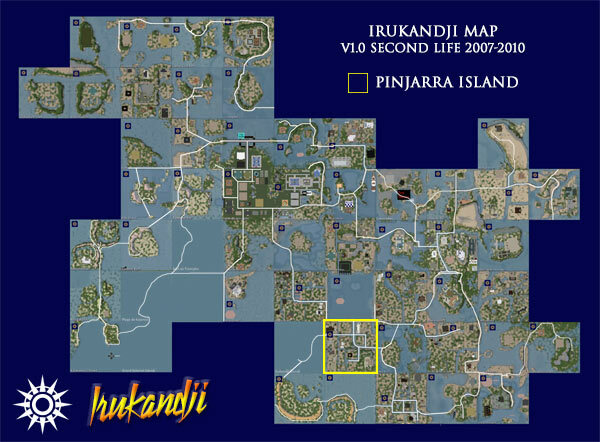 NOTE: This page is about Pinjarra Island in Second Life. 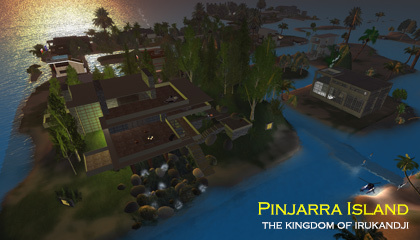 The InWorldz version is here: Pinjarra Island in InWorldz. Pinjarra Island is a residential island in Tamita State in central Irukandji. 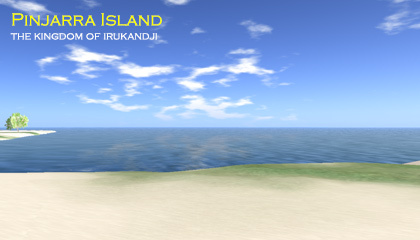 Located due south of Tamita Bay, Pinjarra Island was the ninth sim that I built in Second Life. It was designed and terraformed by hand as a blend of Tamita Island and Alantay Island. Pinjarra Island features a tall split mountain at its centre and a network of narrow canals surrounded by bays. Neighbouring islands clockwise from west were Irukandji Sound, Alantay Island, Tamita Bay, Tamita Island, Tiamo Reef, Manatu Island, Sulawesi Bay, and Kebo Atoa Lagoon. At its peak, Pinjarra Island supported a population of around 30 people from UK, Germany, The Netherlands, New Zealand, Australia, and USA. 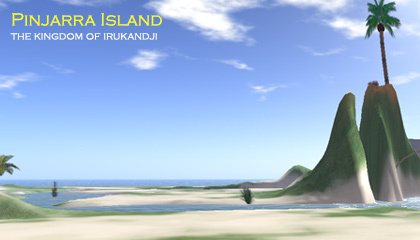 Pinjarra Island is one of the 'sacred sims' of Irukandji, in that it plays a large part in the kingdom's history. 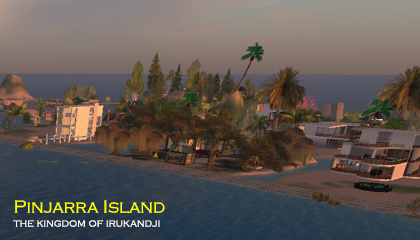 Four years later, I would recreate Pinjarra Island on the InWorldz virtual world. Pinjarra Island, once called West Pearl Island, was renamed for the tribal elder, Pinjarra, who returned to the island after decades of slavery in the sugar plantations. His story is told in the Tale of the Twin Pearls. Seventy years later, this piece of history would lead to the Tamita-Pinjarra War. Below are a few photos of Pinjarra Island that I took during my travels around the kingdom.